09. What Would a Wookie Do? With everyone appropriately ga-ga over the last couple CLUTCH albums, it's easy to forget that the shaggy, tinfoil-hat-wearing stoner rock artisans used to be a pretty abrasive, heavy, and goddamn mean sounding band. There's a vocal minority out there who think the band peaked right out of the starting gate with their vicious "Passive Restraints" EP (on Earache, no less!) and proceeded to get all goofy and beard-y from there. Me, I like all eras (though I stand by my claim that a lot of those mid-period records were pretty soggy in places). So I dig where they are now, yet I'm happy as hell to delve into this odds 'n sods collection. The centerpiece is the four songs of "Pitchfork", the band's debut seven-inch, but also included to flesh it out to album length are unreleased tracks (the squalling New York angst of "Nero's Fiddle"), demo cuts that became the "Passive Restraints" songs, and — should the contrast between old and new CLUTCH not have been readily apparent, two new songs recorded this March. The old stuff is angular and harsh, Neil Fallon's vocals sounding hoarse as a cigarette cough, angry minimalist rhythms clanking along purposefully like prime early HELMET, only with more mosh-friendly primal throb. Evolution is a funny thing — these gritty, feral songs show a young, dirt-mouthed band of wild-eyed gutter merchants that could have just as easily evolved into another UNSANE or TOOL — indeed, either of those paths would have made more sense than the one they ultimately took. 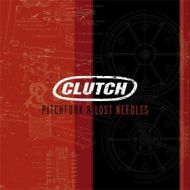 "Pitchfork and Lost Needles" is an essential piece of the CLUTCH canon, and one well worth picking up, for those occasions when their new records just aren't abrasive enough — you know, all-night meth binges, broken-bottle bar fights at last call, that sort of thing.